Oracle is eager to offer companies a ULA, an Unlimited License Agreement, especially at the end of the financial year. If these companies are considering an ULA, this company obviously met the criteria : a large company with Oracle products in their roadmap, and anticipating a growing usage of Oracle products. This offer will not be done to the so called ‘midsized’ companies. 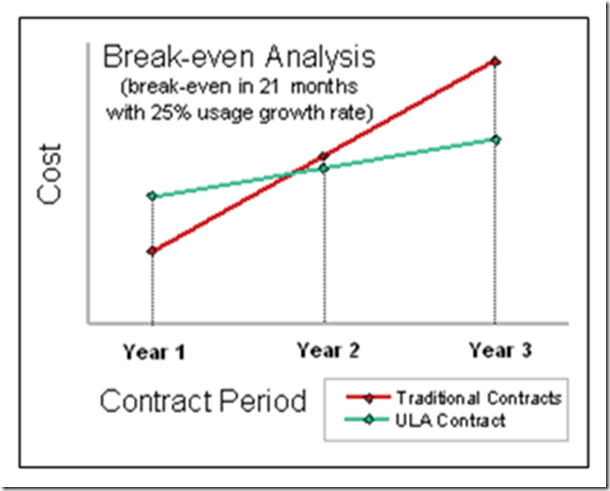 Such an ULA agreement may be very benificial to companies (and Oracle), but, with all agreements, you should be aware of the pitfalls and opportunities of such an offer and that’s mainly what this short blogpost is about. Let’s start to explain (if not already clear) what an ULA is about and quote a part of a definition of an ULA, written by Oracle: –> An Unlimited License Agreement is a time­based contract for unlimited use for a subset of Oracle products. The concept of an ULA: make an investment in licences in specific products which they expecting to use in a fixed timeframe, usually 3 to 4 years , paying for licenses of predefined products they will likely need the years to come. The support has also to be paid in advance, from the first year on, based on the investment amount. At the end of the timeframe you own the licenses which are ‘installed and running’ (according to the agreement-text). In return you will get a very high discount, and Oracle claims a simplified administration, support, lower TCO, predictable costs. Where’s the catch? Two obvious ones: Oracle locks out some competition for a few years and preserves a support revenue stream for possibly a lot of years. What riscs are still out there knowing that? When Oracle (sales-department) and company X reach an agreement, the company has to invest in 150 processor licenses for a Database Enterprise Edition and in 120 processes Weblogic Enterprise Edition, and the payment for support starts right away. 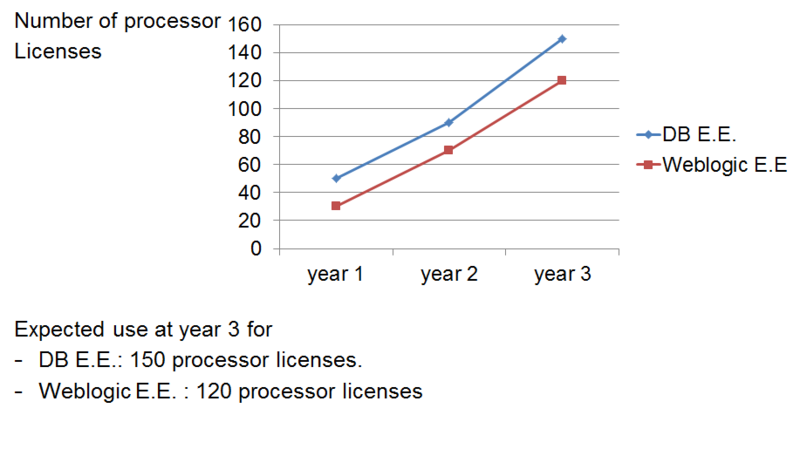 When at the end of the ULA agreement company X turned out to use 300 processor licenses of DB E.E. 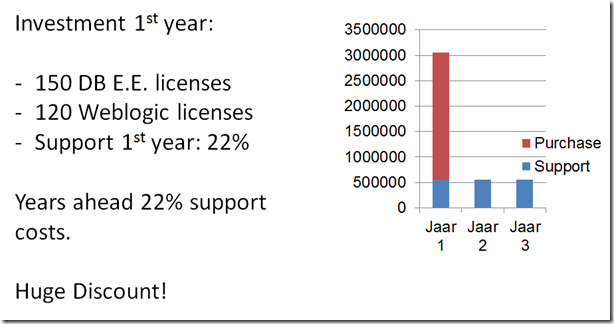 and 200 Weblogic E.E., they own these licenses and no extra fees have to be paid. 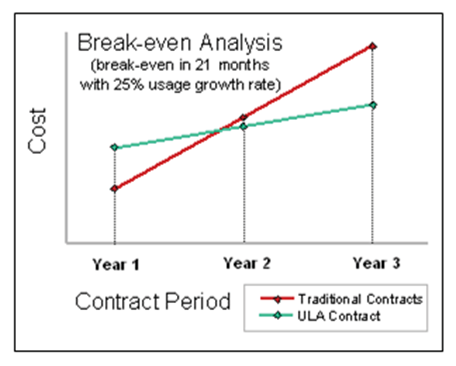 According to Oracle sales there could be a break-even point in 21 months, comparing a traditional contract and a ULA contract, based on a 25% growth rate (and probably a few other assumptions). 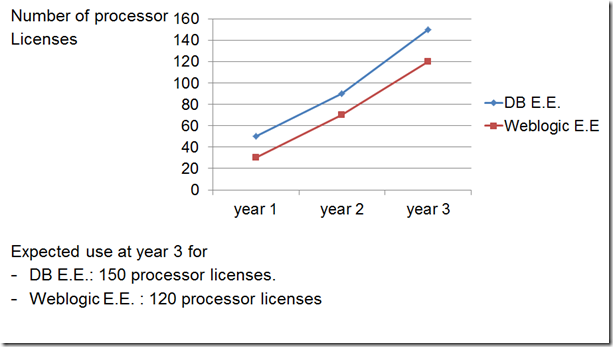 For what kind of Oracle customers may this license model beneficial in very general terms: – Those who expect to deploy a significant number of new licenses in the next few years – When there’s confidence of their deployment schedules the next years – In very general terms: those who has thorough knowledge of : –> what they own –> what they are using –> what they will need the coming years. With what kind of questions has Company X to deal with (this list is not exhausting) ? How is the number of licenses calculated when initiating the contract. —> Oracle sales will come up with an estimate, based on interviews and knowledge of the company (!). This is a highly negotiable estimate. What happens to the existing contracts —> The existing contracts, based on NUP’s or processor, will be merged into this ULA. One contract, one csi-number. The existing support-amount will be added to the contract. Is it possible to initiate the ULA based on a mix of NUP’s and processor-based licenses —> No, the ULA is based on processor-licenses. This is not negotiable (this has been tried, didn’t work out…). What kind of discount is possible —> A dangerous area to answer, but discounts of 70% are not rare. What’s the base of this discount —> As the ULA is based on processor-licences, the discount is based on the prices of an Oracle processor. Will Oracle LMS (License Management Services) accept the counted numbers at the end of the contract —> The contract says there’s no ‘true-up’, and experience learns that Oracle accepts a lot, but always be aware of one clause in the contract: ‘Oracle reserves the right to count… ‘. This sentence means that LMS will be involved when Oracle think it’s necessary. 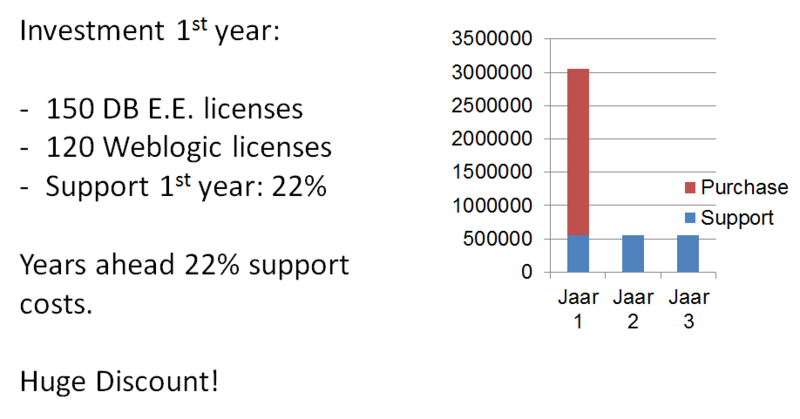 What happens to the support fee when the number of licenses is much higher at the end —> The support fee will be a fixed price and can be raised by maximum 3% a year. This percentage is based on the agreed support fee amount. What happens to the support fee when the number of licenses is much lower at the end —> The support fee will be a fixed price and can be raised by maximum 3% a year. This percentage is based on the agreed support fee amount. What if Oracle software has been installed on a large ESX-cluster —> The number of licenses counted will be a lot higher… . Be aware: when you install an option of the database on this VMware cluster, which is not in the ULA, you’ll have to pay this option…..
Is there still license management needed as this contract will be activated —> YES ! one of the reasons why this is needed, has been answered in question 9. Will the software installed in the public cloud be counted at the end of the contract —> Oracle software in the public cloud is not allowed to be part of the true-up at the end of the contract. As already said, this list is not exhausting, and it may raise other questions. Keep in mind that closing an unlimited license-contract in a vulnerable position, e.g. when LMS has been involved, is generally a bad idea. Also when there’s no thorough understanding of the licenses owned, used and needed by your company. We are happy to answer more questions regarding initializing , managing and controlling utilizing at the end of a ULA. Feel free to contact us, publicly through this post, privately through our contact-page. – Oracle: Unlimited License Agreement. – Experiences of AMIS with initiating and managing a ULA. Also in controlling the utilization of the ULA at the end of the contract.